Effective communication is the key to effective management. The new technologies may enable us to send and receive messages at the speed of light, but the understanding and interpretation of those messages still depends on the clarity of the message itself. A meeting or set of instructions is worthless if its message is ambiguous. Hearing is something we do all the time. Listening, on the other hand, is the process of decoding, understanding, and retaining what we have heard. As a result, management and staff have a vested interest in ensuring that the message presented is the message received, and that what is said is what is heard. Management must be sure the message is clear and concise and that the listeners have the skills to understand the information as presented. Having listening skills is essential to absorbing and comprehending the message. To improve your listening skills, consider the following. Pay absolute attention to the presenter. Listen not only to the words but also to intonations of the voice and observe the body language. These markers communicate as much as the actual words because they provide indications of the importance attached to specific subject matter. If you are listening to a formal presentation, save your questions until the end. Everyone will benefit from hearing the uninterrupted flow of the speaker’s argument. This allows the presenter to complete the line of argument and perhaps actually answer your question before you even ask. Phrase your question carefully. You must be specific in your question to receive a specific answer. Do not ask open-ended questions. A well-structured question relates directly to what has been presented and simplifies the work of the presenter. Do not interrupt the speaker’s answer to your question. Interruption redirects the presenter’s thinking and, as a result, the response may not be as in-depth as it should be. Always acknowledge the answer to provide closure to the presenter and other participants. Leave your personal biases and opinions at the door. We all have an opinion on how the system should operate but clinging to one idea closes the mind and does not allow for understanding of the other point of view, nor does it encourage the creation of a dialogue or the possibility of creating an entirely new process. Presentations are built from the ground up and contain snippets of information that may seem off topic to the listener but are part of the larger message. If you are unsure about the relevance of the specific item, make a note. When it is time for discussion, ask a question to get clarification as to how the point ties into the overall project. When colleagues ask for clarification, let the presenter handle the question. Do not distort the question by interrupting or adding your opinion unless asked by the presenter to do so. Know your audience. Know what they need to know and do not talk over their heads or treat them like simpletons. For example, an engineer would present the same information one way when talking to fellow engineers and in a different way when addressing salespeople to upgrade their product knowledge. Make sure you have the central point of your presentation clear in your own mind. Be enthusiastic and entertaining. No one benefits from a dull, monotonous, fact-filled presentation. Indicate the length of the meeting, its purpose and the topics to be covered. 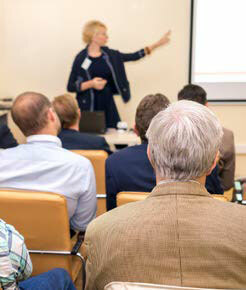 Explain what attendees are expected to know at the end of the presentation. Ask for the participants’ attention. Request that all smart phones be turned off. Keep the meeting short and on topic. Be prepared. Know your topic better than the participants. Anticipate any questions they may have. Do not wander off topic with anecdotes but use plenty of simple illustrations. When participants raise enquiries outside of the agenda, indicate that the issue is outside the scope of the discussion and ask them to talk with you about the issue after the presentation. Check your equipment before starting the presentation. Make sure beforehand that all your equipment is working. Check and double check that your projector, computer and software are working. Always have backup available. If the Internet is necessary, be sure it is on line and working. Toward the end, summarize the main topics and line of argument. Close by restating the purpose of the meeting and how the subject matter achieved this purpose. Reiterate the goals and ask individuals if the presentation, in their opinion, met specific goals that you had hoped would be obtained. Provide a hardcopy summary of the presentation at the meeting or later on the corporation’s website. Stay within the time allowed. Employees and employers have a responsibility to ensure that what is communicated is understood by the one receiving the communication. Good listening skills enhance efficiency, effectiveness and harmony within the work place.